"At first I thought the title of this book was strange, but the more pages I read the more I realized it was perfect. The author was a “grunt” during the late unpleasantness in Vietnam. No disrespect is intended by that term: the kids who did the fighting (and they were kids) had few illusions about what they were doing and precious little knowledge of why. Yet they did what they were told to do for the most part, risked their lives, all too often lost their lives or were wounded, and received little or no thanks for it from a “grateful” nation, irony intended, to this day. 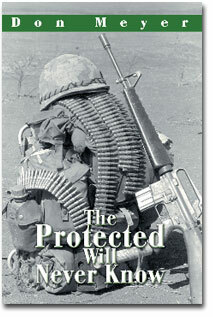 The protected indeed did not know much about their valor, still do not know, and, we now know, were probably not even protected, nor needed protecting. It's time for that nation to look back on the event and ponder it, high time. The author, prompted by a post-service GI Bill English class, compiled the material from a journal he had kept at the time and letters to folks back home and created a narrative of his experiences in Vietnam. Uncertain what to do with it, he set it aside for more than 20 years. He credits his daughter for motivating him to do something with it. He published it, and we should all be thankful. The book is a fresh and riveting account of what it was like to actually be on the front lines of that sad episode in our history, told by one who was there and in the style of one who was there at the time. This is not polished prose but it is highly readable prose. I actually hated to put it down when I had to. There is no plot. Instead, the events flow in the random, chaotic order of someone caught up in a perplexing war: periods of seemingly endless boredom interrupted abruptly by terror, mortal danger, agony and slaughter, to be followed in turn by more tedium and all that over again. That grunt, or front line soldier, had little knowledge of the historical context, the strategic situation, or the winds of politics and diplomacy. His world was right around him. His job was to do what he was told and survive, if he possibly could. That's the picture this book conveys. In many ways the book reminds me of other unforgettable memoirs of young men on their own for the first time, of people caught up in events over which they have no control. For that reason alone it is worth buying. But stir in the fact that the action happens in our own time and it resonates today and you not only have a fine, entertaining reading experience in your hands: you have something that could change the way you think about current events."